Coming back from a trip to Australia, my family stopped in Hawai'i for two days. Naturally, since both my parents were scientists, we headed up to the Hawai'i Volcanoes Observatory. 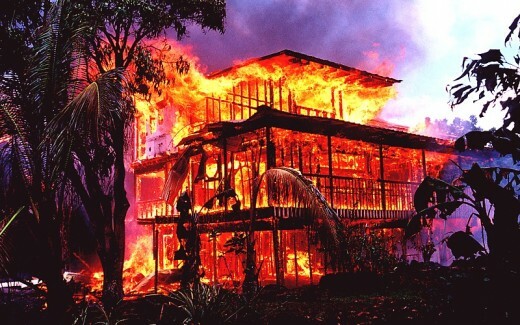 "Is anything erupting?" we asked. The on-duty volcanologist checked her watch ostentatiously. "Give it another few hours." She wasn't kidding. At the time, Pu'u O'o, a volcanic cone on the side of Kilauea Volcano, had been erupting about once a month, about 28 days apart. 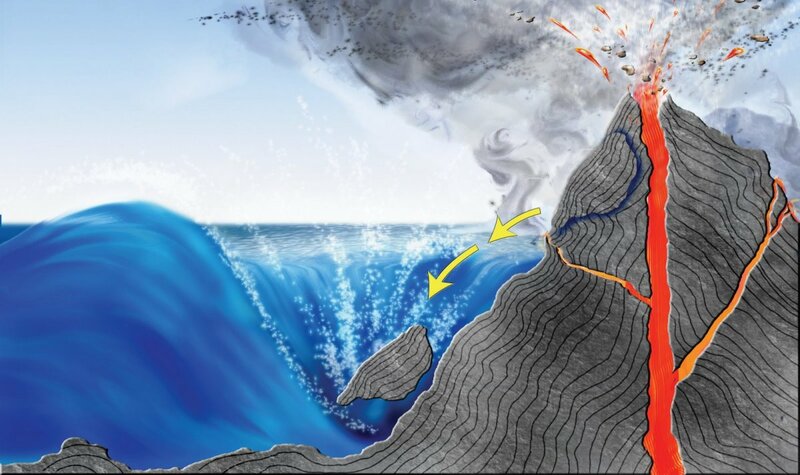 The supposed cause was tidal forces acting on a weak crust, although the joke at the observatory was, "Well, Madame Pele is a goddess, after all." Pele was the Hawai'ian's volcano goddess. Even scientists pay lip service respect to her: their observation post is perched on the lip of an active volcano, after all. 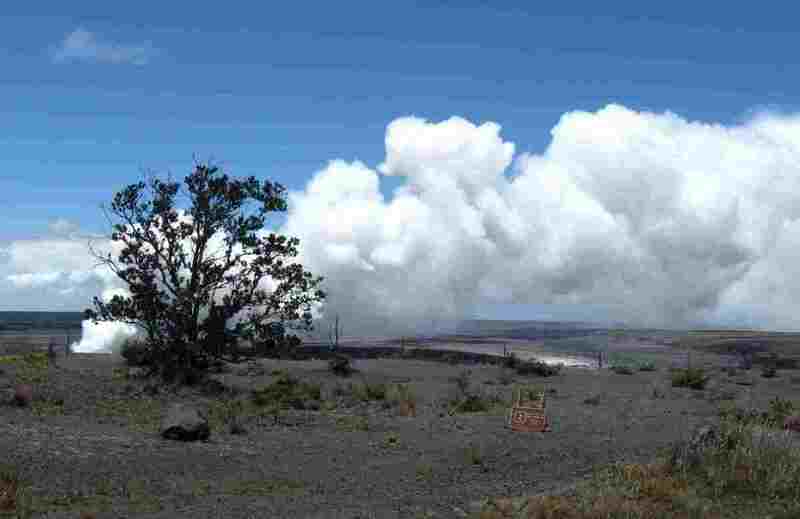 Sure enough, that afternoon, while we were hiking near another dormant volcanic vent, Mauna Ulu, we noticed more steam issuing from nearby fumaroles. A flotilla of helicopters passed low overhead, flying back from Pu'o O'o, some miles away. We were hiking uphill of Pu'u O'o in an area open to visitors, but we waved to make sure the pilots saw us, just in case! Turning back, we headed for the prime eruption viewing spot, a gas station about seven miles from the cone. 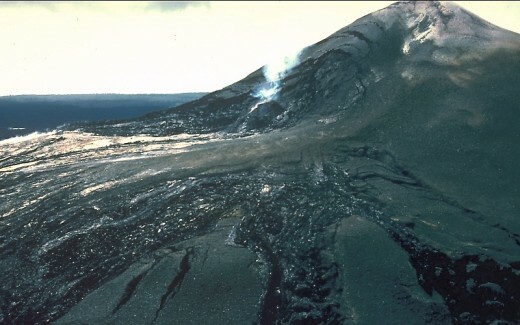 Pu'u O'o wasn't erupting from the top, as in previous eruptions. Instead, it had opened up mile-long fissures on either side of the cone. 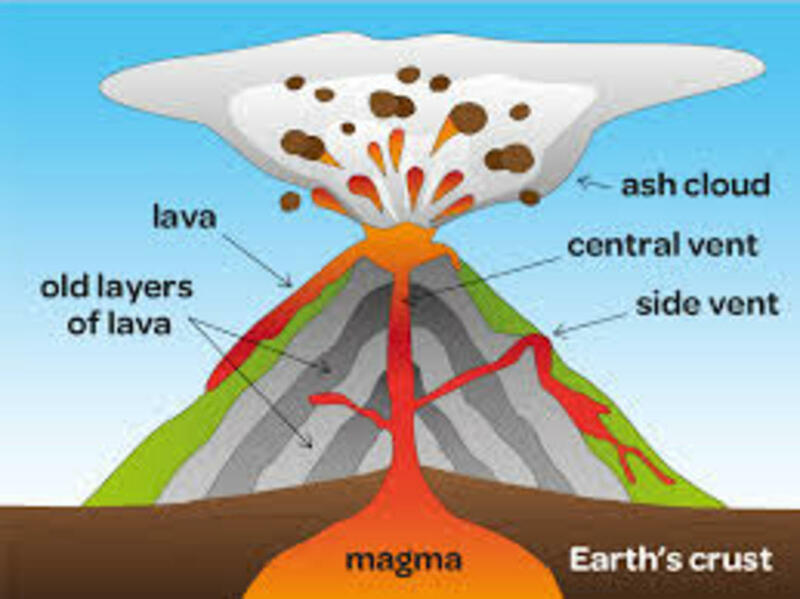 A geologist told us that he and others had been waiting for the eruption to start when their instruments detected the magma coming up under their feet! Helicopters had whisked them away about half an hour before it broke through. Now, a wall of 500-foot-tall lava fountains was dancing redly on the horizon under lowering clouds. 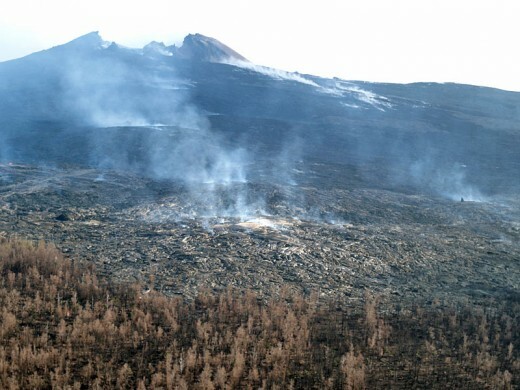 We watched until night fell, then drove around the other side of the island to watch the lava flows creeping downslope towards the ocean, burning through ohi'a forests. 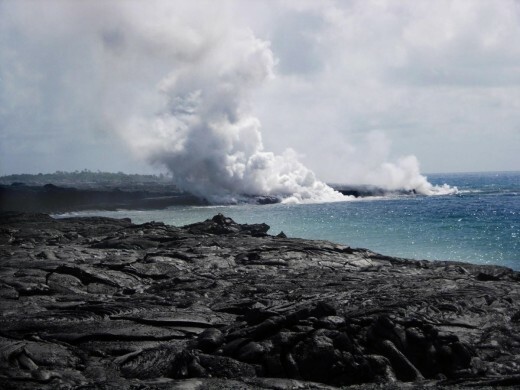 By day, the toes of lava looked black, with white steam and smoke rising up. At night they glowed and crinkled like enormous embers. My mother touched my shoulder and pointed up as we watched. The red glow from the lava lighting up the clouds appeared to form an old woman's face looking down on us. An optical illusion, of course. Nevertheless, I tossed some ohela berries into Halema'uma'u Crater the next day with a silent mahalo to Pele. 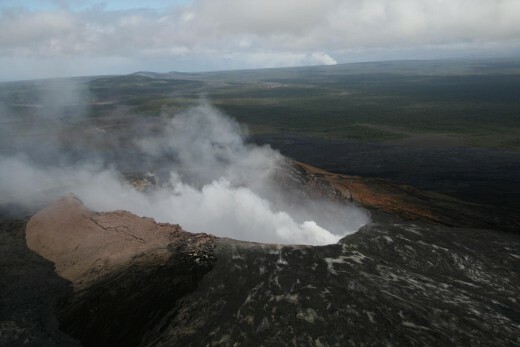 Summit crater of Kilauea Volcano. Pu'u O'o cone on side of Kilauea Volcano. 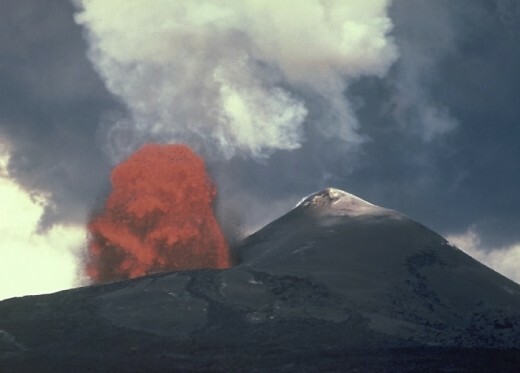 That was in July 1986, when Pu'u O'o was three years old and 800 feet tall. I've been following it ever since. 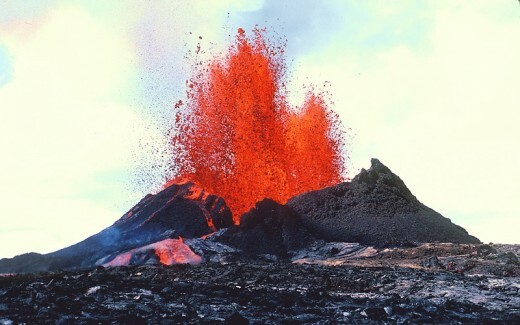 One of the fissures that opened that day turned into a huge lava lake, Kupaianaha. It lasted into 1992. The lava flows have glassed over the top and formed "lava tubes," piping huge volumes of lava down the mountainside to the ocean. The map shows these tubes and lava flows as black tendrils spilling downhill from the vent. They have added hundreds of acres of new coast since my visit. Nowadays, Pu'u O'o usually has a lava lake in its summit crater, with more fissure eruptions on either side breaking out every few months. The summit of Kilauea has started erupting, too, filling part of Halema'uma'u with a lava lake on one side of the crater floor. Someday, I want to go back and see how everything has changed. 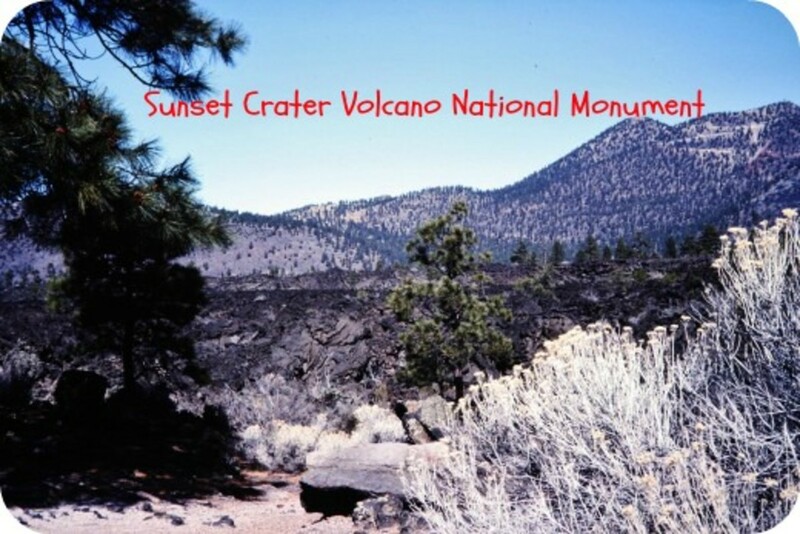 In the meantime, I watch via the Hawai'i Volcanoes Observatory Website. Their web design hasn't changed since about 1994, but there's a lot of good information there -- if you know where to look! 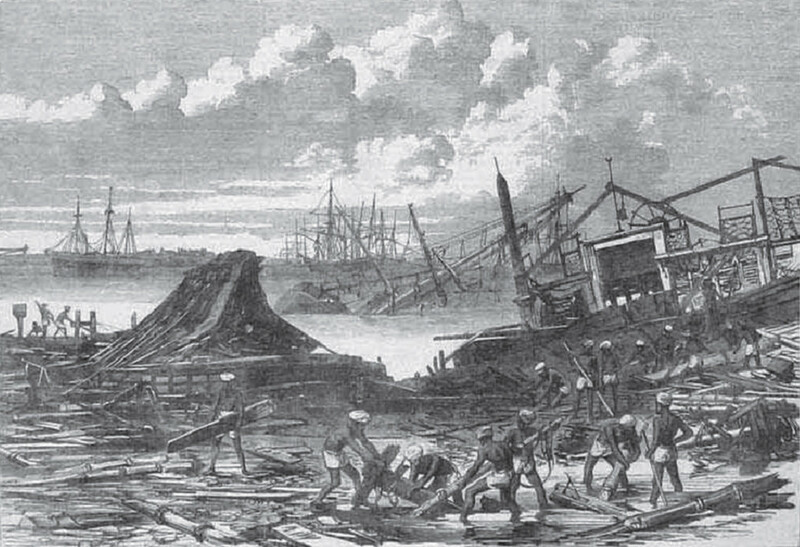 Most USGS images are public domain (see copyright information), unless otherwise noted. So let me share with you a few great photos from the Pu'u O'o eruption. Chain of Craters road is the old highway that used to run along the ocean and then zigzag up the gentle slope to Kilauea and Hawai'i Volcanoes National Park. 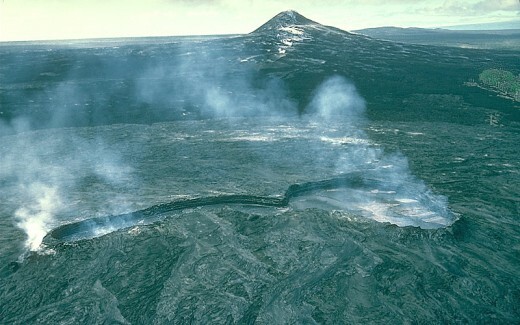 In 1986, I stood on Chain of Craters Road watching the lava flows coming downslope from Pu'u O'o. My parents returned a few years later and saw the lava cut across this road for the first time. 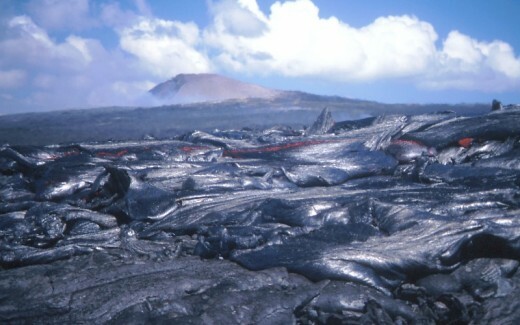 You can see why Kilauea is considered a relatively "safe" volcano: the lava moves slowly at a distance from the vent. Just follow signs and do NOT walk out on cooling black crust, which could have molten rock underneath! Unfortunately, "relatively safe" doesn't mean "harmless." 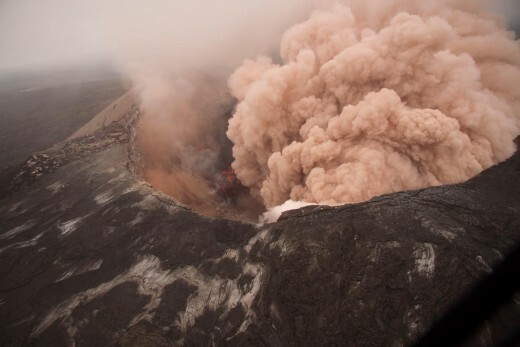 At times this eruption has spilled out of Hawai'i Volcanoes National Park boundaries into the Royal Gardens Subdivision and the town of Kalapana, destroying houses and businesses. Also, "vog," emissions from the volcano mixed with fog, makes for bad air downwind of the volcano some days. Have you ever seen a live volcano erupting? Yes. In fact, I live near an active volcano! Hear that huge sucking sound? 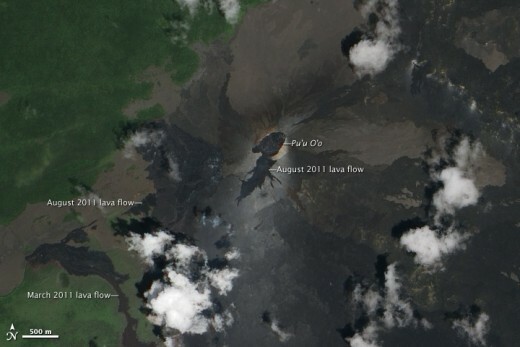 A couple of times in 2011, the crater of Pu'u O'u has filled up with a lava lake over several months, then collapsed in the space of a few hours. It did it back on March 5 (right) and did it again on August 3. There's a couple great timelapse videos of the August 3 collapse on HVO's Current Eruption Images page, which is the best page for following the latest news on Pu'u O'o. HVO Webcam Page: Realtime views of current eruption! 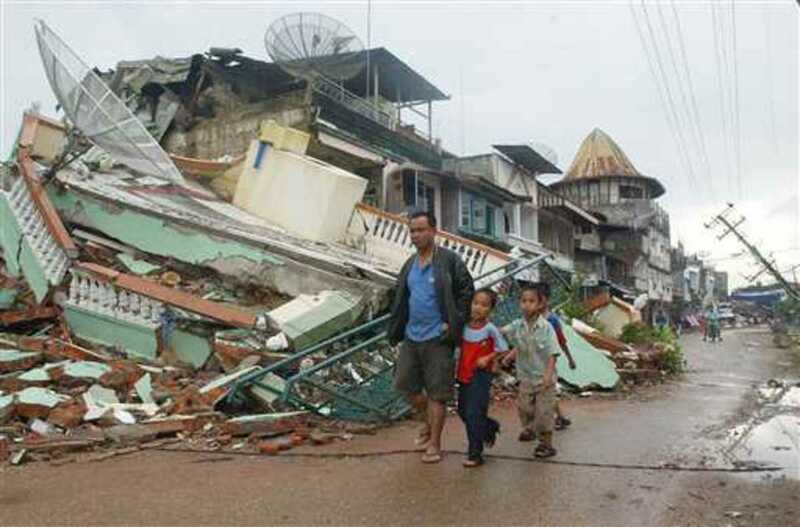 This link jumps straight to HVO's webcams. 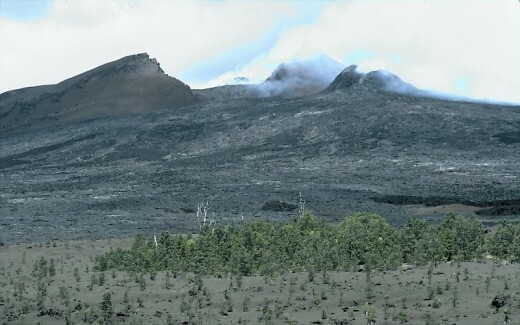 Some show active vents (Halema'uma'u, Kilauea's summit crater, and Pu'u O'o cone). 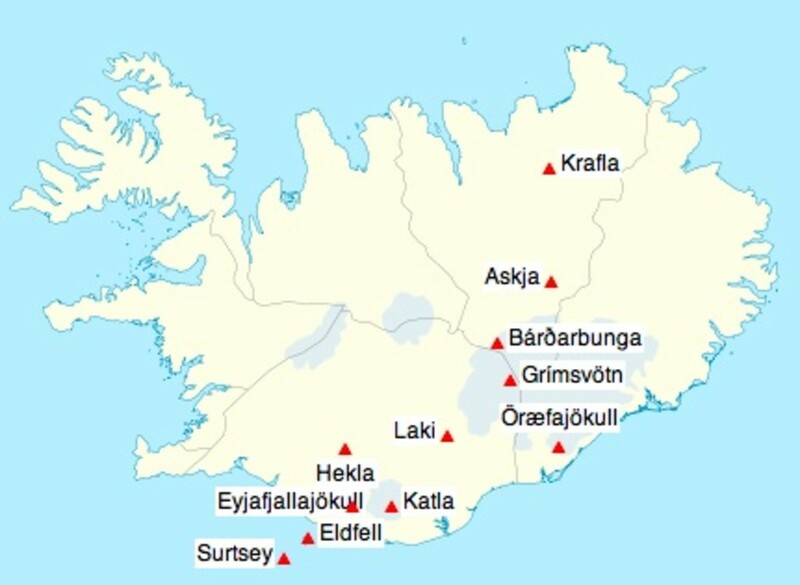 Others are places that have been active in the past few years and might erupt again. I was born in Hawaii..